Ancient Greece, the Palace of Knossos on the island of Crete. The hero Theseus has travelled from Athens to the Palace of King Minos to kill the terrible monster called the Minotaur that lives on human flesh. When Androgeos, son of King Minos, was sent to kill the bull of Marathon by Aegeas, King of Athens and father of Theseus, he was slain by it. As revenge for the death of his son Minos waged war on the Athenians and defeated them. Minos then ordered that the Athenians pay a blood tribute to him by sending seven youths and seven maidens to Crete every year where they would be devoured by the Minotaur. 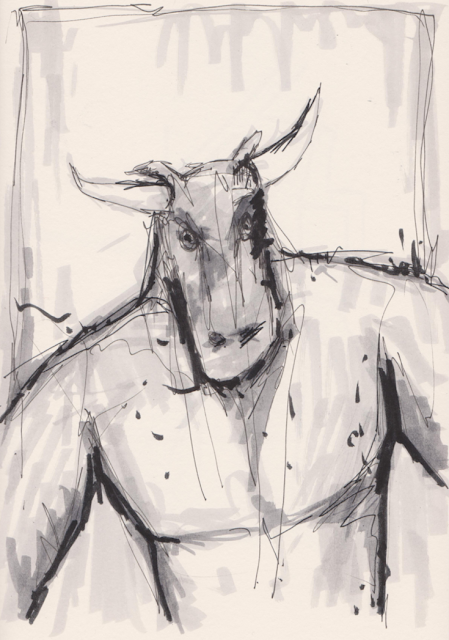 With the body of a man and the head of a bull the Minotaur is a ferocious creature that Minos keeps contained in a labyrinth beneath his palace. 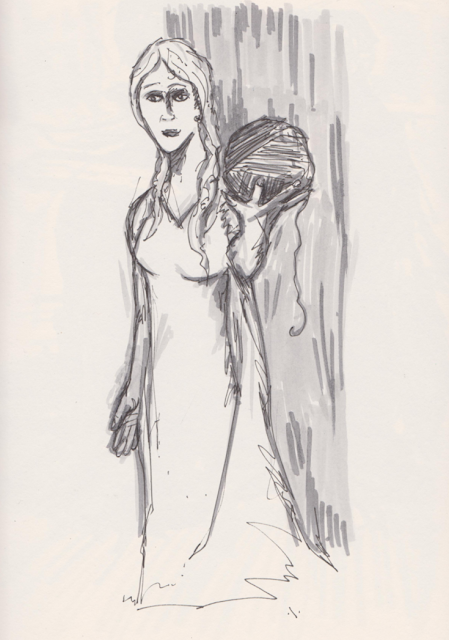 Now, as Theseus is about to enter the labyrinth, Ariadne daughter of Minos hands him a ball of thread. She has fallen in love with Theseus under the influence of the Goddess Aphrodite. She instructs him to tie the thread to the doorpost at the start of the labyrinth and to use it to find his way back out. She then tells him to go forwards, always down and never left or right in order that he will reach the centre of the labyrinth where the beast is held. Theseus promises that if he escapes he will take Ariadne with him to Athens. They embrace and then Theseus travels onwards alone in the flickering light of torches placed on the walls. 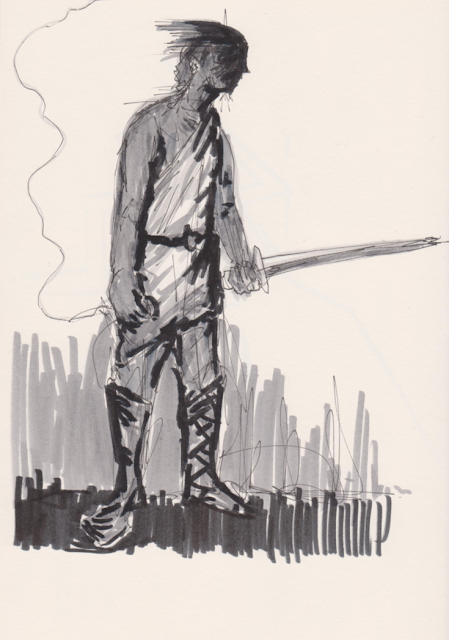 With one hand he unwinds the ball of thread, in his other he holds a sword he had hidden in his tunic. The walls have pictures of youths leaping over the horns of bulls and paintings of double-headed axes. From the darkness ahead he hears the snorting sounds of a bull. Theseus emerges into a large chamber and faces the Minotaur who is tearing at the flesh of one of his victims. On seeing Theseus the enraged monster rushes towards him. Moving like a bull-fighter Theseus side steps the Minotaur. However, Theseus is forced to drop his sword and grapples hand to hand with the beast. 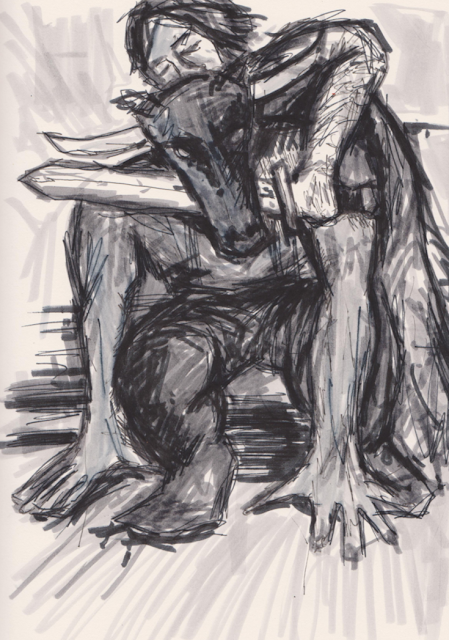 Finally, driving it to its knees and holding its head by one of its horns, Theseus seizes his sword from the floor and stabs the Minotaur in the throat. Blood showers them both. The Minotaur bellows and gasps and then grows weaker. Standing over the monster Theseus draws back his right arm and strikes a terrible blow across its neck completely severing its head. The body of the Minotaur slumps to the floor and Theseus raises the head high in victory.